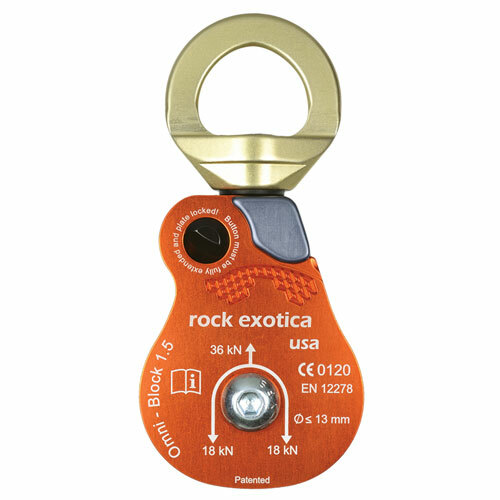 Perhaps the coolest pulley we offer, the Omni-Block combines a swivel and pulley into one tool, and incorporates a unique sideplate that opens while the pulley is still attached to the anchor. Whereas traditional pulleys are connected to a carabiner and require removal from the carabiner to change the rope, the Omni sideplate can be opened without detaching from the carabiner. Because the Omni eliminates the need for an extra carabiner, you get a reduced overall length and fewer total pieces of equipment in the rigging system. This means less total weight and better functionality in high-angle, confined space or other space-sensitive rigging environments.